This tourist’s postcard photograph titled “A Regular Sunday Crowd – Avila, California” was taken in the town of Avila Beach in the early-1950s on Front Street. The view is looking toward the center of the town with Avila Beach Park and the commercial fishing pier on the right. The oil storage tanks on the hill where a part of Union Oil Company of California (Unocal) storage facility. Avila Beach is located in the mid-coast area of California one-hundred and sixty miles north of Los Angeles near Pismo Beach. The small coastal town first served as a shipping port for the City of San Luis Obispo beginning in the mid-1800s and was later supported by fishing and the oil industry. In the late 1990s due to rusted Unocal oil pipes and the resulting leakage over the decades of use, many of the buildings in the town were demolished; afterward a one-quarter mile long section of the contaminated soil and most of Front Street were dug up and transported by truck to Bakersfield. The soil was replaced by sand from nearby dunes and the town was then rebuilt. Share with us what you find of interest in the vehicles in this photograph courtesy of Michael J. Semas. 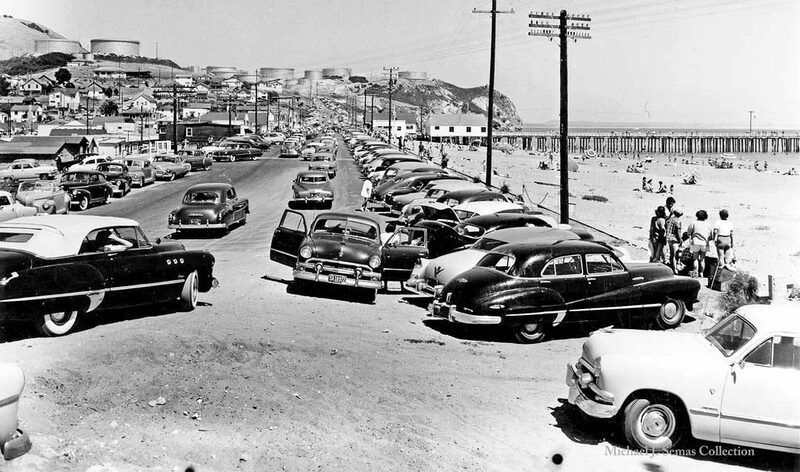 This entry was posted in Auto photos 1946 - 1965 and tagged 1940s Autos, 1950s Autos, Avila Beach California. On the far left, turning to the left, is a 1949 BUICK Super convertible and parked beach-side, across from this vehicle, is either a 1946 or ’47 BUICK Super sedan. Farther back on the left, a ’50 Buick Special that seems to be a base version (no side trim) of the Jetback 4-door. And a bit beyond that appears to be a ’52 Lincoln (smaller insert above the bumper but has an emblem on hood above the grille vs a ’53. On the left edge, a ’53 Plymouth sedan. The grille’s hard to see but the front bumper is mounted close to the body vs a ’54. It’s likely a Cranbrook with its side trim visible over the rear wheel. I’d have to think living below a fuel tank farm would be the equivalent to living next door to a nuclear reactor today. Howard, you’re not far off…about 10 or so miles north of this is the Diablo Canyon nuclear power plant from the mid-‘80s, the last one in California and due to be closed in about 5 years. There was a known fault line about 3 miles offshore and they discovered another one less than a mile away about 10 years ago. Almost a black down Front St. on the left, I spot a `52 Lincoln Capri hardtop. Second car down facing the beach appears to be a `52 Cadillac sedan, with gold “50th Anniversary “V and Crest” on the rear deck. Just ahead of the 52 Lincoln appears to be a 1948 or 49 Olds 98 club sedan. Parked on the left side of the street & facing the camera, 1st car, is a circa 1950 STUDEBAKER Starlight Coupé and 5th car behind this vehicle is a 1950 BUICK Special Jetback Coupé. Parked just behind the circa 1950 STUDEBAKER is a 1941 BUIICK Special Convertible. Lots of Buicks per acre here, always a good thing! I see a ’53 Plymouth Cranbrook / Belvedere (light colored car) parked alongside the first building in the left of the picture. Pat W.: Is the pier still there? Yes, the pier is still there and so are the several buildings right in front of it. It was closed for a few years but is now set to reopen. The pier itself stretches out quite a bit longer than what is seen in the photo. Something you hardly see anymore: Telephone poles. Especially, blocking a beach view. 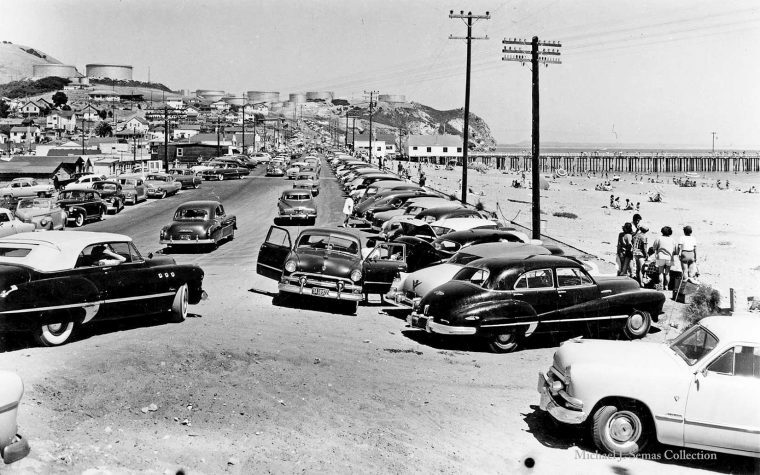 Do a quick search for The evolution of Avila Beach and you will see a short article with pictures. Look’s pretty darn nice now with no tanks on the hill. Living in the Monterey Bay area and having owned an ex San Diego 1937 Seagrave Fire Engine that had a second life in Shell Beach Fire district, and having worked for Cal Fire in San Luis County, I would think I have been there but maybe the mind is just failing and I have been there …. Possibly will have to take a road trip down there this summer….. I lived in SLO (San Luis Obispo) a few miles North from here in the early 60’s and spent as much time as possible on this great beach. They had the best corn dogs and fresh lemon aid. Some time later 70’s or 80’s the hole town was removed because of ground contamination. Two Starlight coupes in one photo – one of my favourite designs.